Time Warner: As Fast as Verizon? Broadband @ Home » Broadband News » Time Warner: As Fast as Verizon? High-speed Internet has come a long way from dial-up modems that forced users to choose between phone calls and websites. 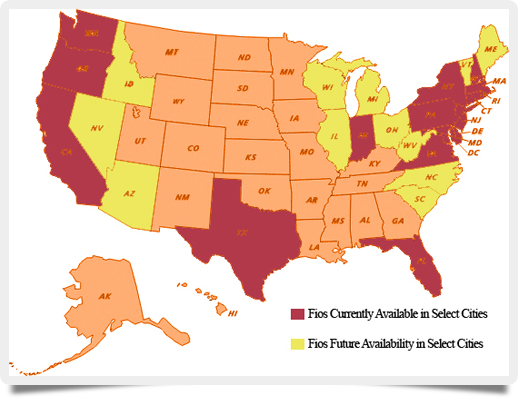 Cable, DSL, and fiber optic alternatives are now available across the country, giving you a host of choices when deciding who gets to supply your Internet connection. Two high-speed giants, Time Warner Cable (TWC) and Verizon, are often held up as rivals — with die-hard fans and haters on both sides claiming that their provider of choice is actually faster. So who really wins this virtual race? Verizon offers one High Speed Internet plan and three High Speed Internet Enhanced plans to customers. These are all DSL based, which means they use your phone line (along with a special adapter) to connect with Verizon’s servers. Unlike cable modems, with which multiple users can share the same network “pipeline,” DSL connections are single and unaffected by the traffic of other users. Verizon’s basic High Speed plan offers anywhere from 0.5 to 1 megabytes per second (Mbps) in download speed, and up to 384 kilobytes per second (kbps) in upload. This translates to almost seven minutes to download 10 songs at five megabytes each, or almost three and a half hours to download a standard-definition movie. The company’s fastest Enhanced plan, meanwhile, provides between 7.1 and 15 Mbps download along with 768 kbps upload. This reduces the song download time to 26.7 seconds and movie time to 13.3 minutes. All plans come with nine email accounts and 10 megabytes of personal web space; in addition, Enhanced plans offer WiFi hotspot access. Verizon also offers its FiOS line of plans, which use fiber optic rather than standard cables to provide access. The slowest plan offered includes 15 Mbps download and 5 Mbps upload, while the fastest comes with 500 Mbps download and 100 Mbps upload. Using this plan, downloading a 5 gigabyte HD movie would take 1.4 minutes. Expect to pay anywhere from $69.99 to $299.99 per month for Verizon’s services. TWC uses coaxial cables to provide Internet access. These are the same cables used to provide television service. Time Warner offers six high-speed plans, ranging from their “Lite” at $19.99 per month to their “Ultimate” at $64.99 per month. Lite provides 1 Mbps download and 1 Mbps upload, along with five email accounts and 100 megabytes of email storage. This will provide a similar download speed to Verizon’s basic High Speed plan. The Ultimate plan, meanwhile, offers 50 Mbps download and 5 Mbps upload, 30 email accounts and 10 gigabytes of storage, along with a free WiFi modem. To put that in perspective, downloading 10 songs with a total size of 50 megabytes would take one second on an Ultimate connection. Both the Extreme and Ultimate plans offer access to TWC WiFi hotspots. If you’re talking about pure speed, Verizon comes out on top, but for many users 500 Mbps won’t provide a noticeable improvement over 30 or even 50 Mbps. If you’re downloading massive amounts of songs or movies, or need a super-fast connection for professional-level online gaming, Verizon may have the FiOS plan for you. If you’re hoping for decent speed with a lower price tag, consider TWC (remember: check your bandwidth regularly with a speed test from BandwidthPlace.com).